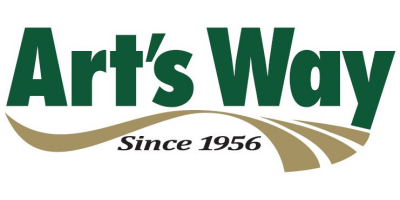 Art’s Way Cattle Maxx offers today’s beef and dairy operations rolled feed in a quality and consistent ration mix. Art’s Way Rollermills provide you with efficient milling for top quality feed from your corn or small grains with lower horsepower requirements. Rolling feed minimizes dust while providing more palatable and digestible feed for improved feed conversion. Rolling with an Art’s Way Rollermill makes all grains more palatable and digestible by fracturing the kernels’ outside hull letting the digestive juices penetrate more rapidly. Consistent particle size produced with an Art’s Way Rollermill provides increased bulk allowing animals to eat more ration, which better assimilates the digestible nutrients. This allows for improved feed conversion. Rolling feed reduces dust in feed. concentrate hopperRear mounted concentrate hopper with built-in sack cutter for easier access. powerful magnetsMounted in the hopper side and throat help minimize roller damage from tramp metal. Auger feeder length 96 in. Auger feeder auger diameter 10 in. Unloading auger tube diameter 8 in. Standard – no extension 16 ft. 8 in. 3 ft. fold extension 19 ft. 3 in. 6 ft. fold extension 22 ft. Supplement hopper 21 in. x 24 in. Approx. weight without auger feeder 3540 lbs. No reviews were found for Cattle Maxx - Model 6105 - Portable Grinder Mixers. Be the first to review!